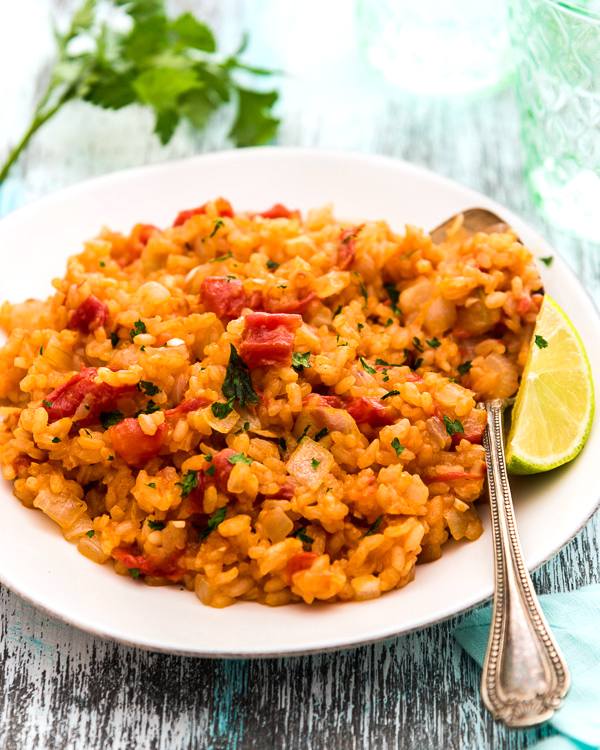 Spanish rice is a great dish to have in your pantry. You can serve it as a side, wrap it in burritos, or add it into quesadillas. Although cooking Spanish rice requires a bit more effort than white rice, we love to cook a large batch of it on the weekend and serve it throughout the week. The rice is so flavorful and goes well with all types of main dishes. Even if you’re not making Mexican food, you can still serve the rice with grilled chicken or steak. To make Spanish rice, you need to brown the rice with onion and garlic. This step will create a nutty rice with tons of flavor. You then steam the rice with tomato and chicken stock to finish up. 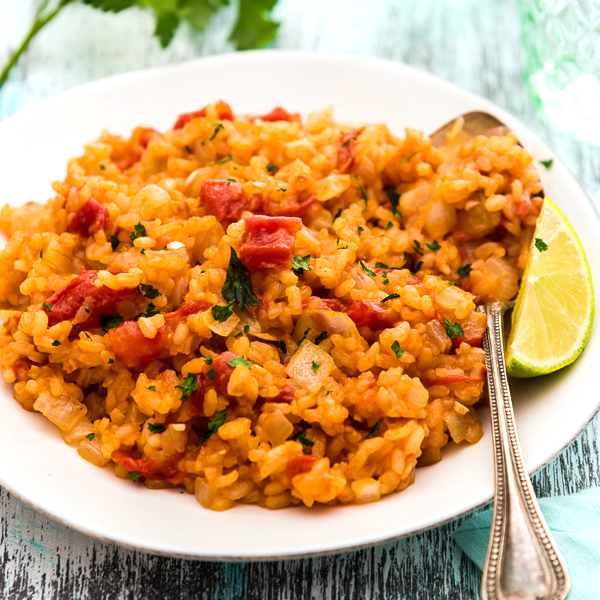 There are several different versions of Spanish rice that use fresh tomatoes or canned salsa. I personally like to use canned diced tomatoes. They season the rice well and will save you some prep time. The only tricky thing is to get the liquid ratio right. Depending on the type of rice and tomatoes you’re using, you might need to adjust the amount of chicken stock. I have included some tips in the recipe below, so you can tweak the recipe according to your ingredients. If you make a big batch, let the rice cool off, store it in small air-tight containers, and freeze it. The rice will stay good for 3 months and you can heat it up in the microwave. You can wrap the rice into burritos, or serve it as a side with chicken or soup. Add butter into a medium-sized dutch oven (or heavy pot) over medium heat. When butter is melted, turn to medium low heat. Add rice, onion, and garlic. Cook and stir until the rice turns pale yellow and the onion soft. Add tomato, chicken stock, and salt. Stir to mix well. Place the bay leaves on top. Cook until boiling. Turn to low heat. Cover and cook for 20 minutes. Remove the pot from the stove. Let sit covered for another 10 minutes. Discard the bay leaves and fluff the rice with a fork. Season with salt according to taste. You could also add sugar to balance the sourness of the tomato. If the rice is too wet, uncover, cook, and stir for another 5 minutes. If the rice is dry but not cooked yet, add 1/2 cup chicken stock, cover and cook for another 5 minutes.